If there is heaven on earth,It is here, It is here, It is here. Kashmir the land of odourless flowers, tasteless fruit, crooked men charmless women. Think about it, if you live in Kashmir long enough , you realise that there is enough visual beauty, but is only skin deep, the fruits look colourful and bright but for some strange reason do not taste great.The flowers remain fresh for long, they lose their odour, regarding women I have not shared intimacy with a Kashmiri woman (but those who have often say they make lousy and frigid bed partners). Its also been said that in Kashmir the only thing straight in Kashmir is the Poplar trees , otherwise the men, the roads, the deals, the interaction reeks of deceit. I am being rather harsh on Kashmir and Kashmiris. But Kashmiri fo od is something else. 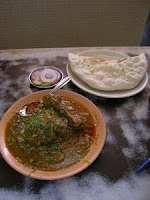 Everyone will tell you that there is Kashmiri pundit Cuisine and Kashmiri Muslim food...... To me both are great. They have their subtle difference is spices and flavouring, use of onion and garlic Vs use of hing, different cuts of meat and different vegetables etc etc. I have a theory that the the Saraswat Brahmins and Kashmiri pundits are genetically realated. They are both fair communities, they have light eyes, they both eat copious quantities of meat despite being brahmins and pundits. The Kashmiri cook or waza has a fairly high status in society. Its often said the cooking charges of Kashmiri food, surpass the cost of the ingredients. The Kashmiri wazas are usually very much in demand for functions and daawats. I have eaten at various places and have been exposed to Kashmiri food in Srinagar ( Mughal Durbar,Hadoos), Poonch, Baramulla, Gulmarg, Sonmarg. Here in Delhi, Chor Bizzare, Defence Colony Kashmiri Dhabas in the nineties. When Himanshu Kumar, invited me to to a do at Nizamuddin East, as part of the EOID (eating out In Delhi Community), I was kind of happy. Though Nizamuddin West is more known for expats (William Dalrymple) or PIO's (Persons of Indian origin masquerading as expats, Arvind Adiga and Pankaj Mishra). This was at Pamela's home,Expats with twist, Indophiles. You enter their home a cascade of blue and white, with charpoys woven with cotton as sofas, more and more Indian memorabilia. I walk onto the terrace its called Pamela ka Dhaba, as more Moodas (stools), charpoys and a push cart as a bar, very imaginative and creative. Here, Ah ad and Sons, caterers of Kashmiri food based in UdayPark near South Extension part 2 in New Delhi and the waza Manzoor had laid out their Wazwan. Before that, an interesting khichdi with walnuts and called Ver was served by one of the members of the forum as a savoury (also she gave me tips to use the Ver masala thats been lying in our larder for a couple of years). The layout was white rice, Rishta, Goshtaba, Rogan Josh (meat curry spicy), Chicken kaliMirch korma, Methi Meat (fine texture, methi and meat were one texture, boneless and pasty), Seekh Kabab, Tab akmaaz(ribs fried in oil, I got the best piece with fat crusted crisp mmmm), Paneer Kashmiri perhaps Shahi, Dum Aloo, Haaq (greens cooked in Mustard oil(actually all the food is supposed to be cooked in mustard oil), Nadru Yakhhni (lotus stems in yummy sauce). The food was good a tad heavy with the meat and sauces, my favourites were the, Rogan Josh, Tabakmaaz and the Nadru. Ideally Kashmiri food is eaten in a Tarrami (a plate shared by four) and you have to be seated to enjoy it with yo ur hands. I slurped it with my hands, but it was kind of difficult, to stand and eat in styrofoam tray. The price to us was Rs 650/- a pop/ Nice to experience so many dishes among like minded foodies on a terrace on aDelhi winter night. Ended the meal with creamy phirni and shaking of hands. Kashmiri food try it I know a caterer or two delivers. please drop in acomment and I will write back. I thought, I was dithering from my cause and have been meandering in more expensive dining and drinking options. Besides, I have been Delhi-centric and have been ignoring my Karam- Bhoomi (Mumbai ) and focusing too much on my Janam Bhoomi ( Delhi). 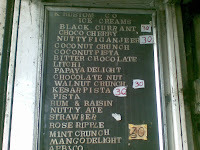 A trip to Mumbai brought back the magic, I did not go to any new place, other than K. Rustom and Co for ice cream. The all under Rs 100/- options I visited were, New Roy al Lunch Home (near Paragon Centre at Worli), Churchgate Stores and Restaurant, Bagdadi Restaurant, Stadium Restaurant (Irani cafe and restaurant near Churchgate) and finally a medium and new Jai Hind, at Dadar at the foot of Dadar bridge on Tulsi pipe road (while coming from the West). New Royal Lunch Home (went their for lunch) offers a lovely prawn thali, chapatis (the soft fold ed kinds), subzi, rasam, gravy, a tiny portion of fried fish and a choiceof a nice helping of prawn koliwada (fried) or prawn masala (thick gravy or masala). Great stuff for Rs 75 or 70/- for the either of the prawn options. Its great taste and superb value for money. Its right next to Mahindra Towers, been around for a few decades. I don't have a picture. But its great. At Bagdadi, we tri ed a lot of stuff, Mutton Qorma, Rs 30/- a weak meat and potatoes dish (very forget able), The fried chicken, Shiny, a colleague said the chicken are from YMCA (they are huge and excercise a lot before they are cooked), as usual was fried and served with a fried potato. The best dish was the chicken masala chilli fry, was the only dish we all focused on with enormous, DTH dish sized Khabooshi Roti's (one is more than enough for one unless you go to YMCA). The meal for three was a handsome amount of Rs 150/-. Was chatting with the waiter he said our signature dish is the Khara Masala Murgh pr iced at Rs550/- and an order needs to placed early (mighty pricey for a place where chicken plate (piece) is going for Rs 50/- will be back to try it some day. 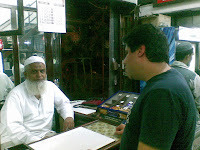 After Bagdadi we had some time to kill, so stopped by and shook hands with the Miyanji at he cash counter at Olympus Coffee house, more famous for their Biryani than Coffee. I could spend a whole week ambling around South Mumbai, Fort and the eating joints, here its wonderful. Drinking is a past time I seldom indulge in now, however being true to the grain, of being self proclaimed evangelist for the salesmen eating and perhaps drinking out. We did drink out at the Churchgate Stores and bar (at the round about on Jamshed Tata Road and at the corner of Cricket Club of India), they have a pitcher Royal Challenge at Rs 140/- on Mondays, Tuesdays, Thursday and perhaps Sundays and on other days its Rs 190/-. We enjoyed it at Rs 140/- (5-6 mugs). Next stop Leopold Cafe, London Pilsner at Rs 180/- a bottle (Its become expensive with all this hullabaloo of Shantaram and terror tourism. We had two or three bottles, amidst scampering around, middle aged goras and goris getting their pictures from all angles in Leopold cafe. The s taff is friendly and chatty (they feel like war vets now). 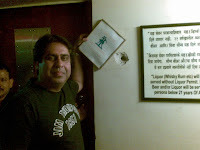 And then moved on to Cafe Mondegar, a pint of Kingfisher, a Carlsberg big bottle and mug of draft beer for Rs 400/-. It had the young dating ad execs, the non terror tourism variety goras and goris and a girl just out shopping from Benetton and music in her head. The point is, in labout Rs 750/- you can visit three decent bars and three grown up men can drink out in Mumbai. I am still loving it. Stadium Restaurant (next toChurch gate Station and short of Mocha), the actors 4 ( Mradul, Sam il, Shiny and Shridhar) The order, Keema Pao, Keema Fry Pao, Egg Bhurjee Pao, Mutton biryani and Veg pulao and some maska buns (for some reason they call it Kheema in Mumbai)Straight forward, simple, eat pay and leave, Rs 318/-. thats four grown up men having lunch. Todays special written oin chalk on a board was Bhindis masala at Rs 35/- and Bhindi Gosht at Rs 70/-Amazing, served on the table, with a refreshing and smiling waiter. Must try it for its simplicity. Now for the piece de resistance, all this while I have been visiting Mumbai, lived a month at the Ritz, twenty forty days at The Oberoi Trirdent (aka Oberoi Towres) several times at The Ambassador and I had never ever visited K Rustom & Co for their ice cream (pretty legendary stuff). Walked in with 5 other gun slingers and asked for ice cream over the counter and the smiling senorita Mrs Gomes smiled and said which flavour, I said you choose, she giggles and says these 8 marathi men are all having Anjeer and fruit. I tasted Waln ut crust, had a fresh strawberry and a fruit and anjeer. Amazing stuff. A slab or thick slice of ice cream in butter paper, taken out and assembled between to large wafer snack ( I hink, thats what they call it). The ice creams are all at Rs 30/- each with fresh strawberry at Rs 40/-. Its a blink and you miss it, Its nearly opposite The Ambassador. You will love. Next time we are giving Baskin Robins the miss which is across the street and opposite Jazz by the Bay (or is it Not just jazz by the bay). Confused lot. Its atleast Bagdadi, Stadium and Olympus and nothing like Stadium and outside and Baghdad and beyond Olympus and others. On the way to t he airport, again four burly men (I could definitely do with some female company on these eating out expeditions i have enough at home as Im usually outnumbered by women at home thats dear wife Praveen and Detective An ( Ananya)), Shantanu, Shiny , Sunil and Self (all S) walk in to Jai Hind Lunch Home at Dadar, this was earlier called Shardha restaurant, I have ordered from it several Dal Khichdi's for lunch when I was close by, busy launching Hindustan Times In Mumbai in 2005. 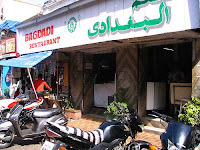 It was vegetarian restaurant and now as Jai Hind is as Non Vegetarian as it can get in Dadar West. 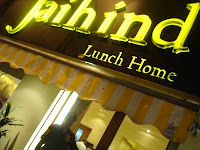 I have been to three other Jai Hind's, near Elphinstone Road and Pali Naka near pali hill (both poor cousins like the Dadar one) and the slightly posh one opposite Kamla Mills at Lower Parel, which has a long wait. Food very good, Bombil stuffed with Prawns, Prawn Hara Masal, Prawns Mangalore Masal and Mutton Sukka with Chapatis and solkadi. Phew! we just ate a lot and topped it for old times sake with Daal Khichdi. The staff especially the one serving us, was fantastic, unobtrusive, caring and smart. the owner attentive and courteous (also its a considerably new outlet). 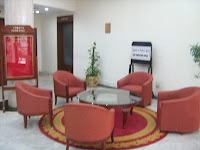 Great fun, a meal for 4 was Rs 603/- crossed the Rs 100/- per head limit by about Rs 50/-. but, it was worth the extravagance. 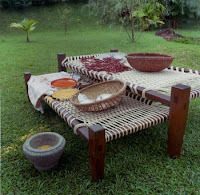 I am motivated to write my treatise soon on Gomantak, Malwani, Mangalorean, Konkani, Goan and cuisines of adjoining areas (Saraswat, Kolhapuri, Vidharba and Coorg) and years of several hundred trips to eat and observe at Ghazalee, Mahesh, Apoorva, Bharat, Trishna, Surmai, Saybaa and Sindhudrg all in Mumbai among others. Just a passing foot note, Stayed at the Ritz Hotel with a huge room the size of tennis court and ordered room service, which i seldom do, ( they have reputed a Continental restaurant called Th e Lido room (sounds more like a 70 s cabaret place). The most outstanding steak sanwich, steak brown fried onions and bread, simple and Rs 140/- a real smasher. Which year did Leopold Cafe open for business ? What's the anglisized name for Bombil ?